This packet contains examples of almost every type of LINE. Some lines are vertical, horizontal and diagonal. There are straight, angled and curved lines. A Young Lady’s Adventure and Women, Bird by Moonlight have many curved lines. Look for angles and/or triangle geometric SHAPE in Chambon-sur-Lac, I and the Village, Blue and Green Music and Figure 5 in Gold. Search for circles in I and the Village, Figure 5 in Gold and Women, Bird by Moonlight. Find square or rectangle geometric shape, especially in Chambon-sur-Lac and Family. Discuss how SHAPE in pictures is often formed with COLOR instead of LINE. Abstract Expressionism is a style of art in which lines, shapes, textures, colors and/or a lack of detail emphasize a MOOD or feeling. Abstract art sometimes uses geometric shapes, and bold, bright colors, in an exaggerated way, to express the subject of a painting. Abstract art is a simplified style that is intended to create emotion and sometimes deliberately abandon any resemblance to the natural world. It is usually active, interesting and fun. Abstract or modern art upsets some people. They feel that “real” art must represent real and natural objects or subjects and resemble a photograph. Some people cannot understand that the artist just wants to create a feeling or MOOD. Paul Klee put it best when he said that if people wanted to see natural and realistic things in paintings, they should use a camera. Abstract art doesn’t have “rules”. Abstract: Not the way something really looks. An abstract work of art is based on a real object. The artist leaves out details or changes the object in the picture to look different than the real object. A style of art in which lines, shapes, colors, patterns and textures are simplified or exaggerated. 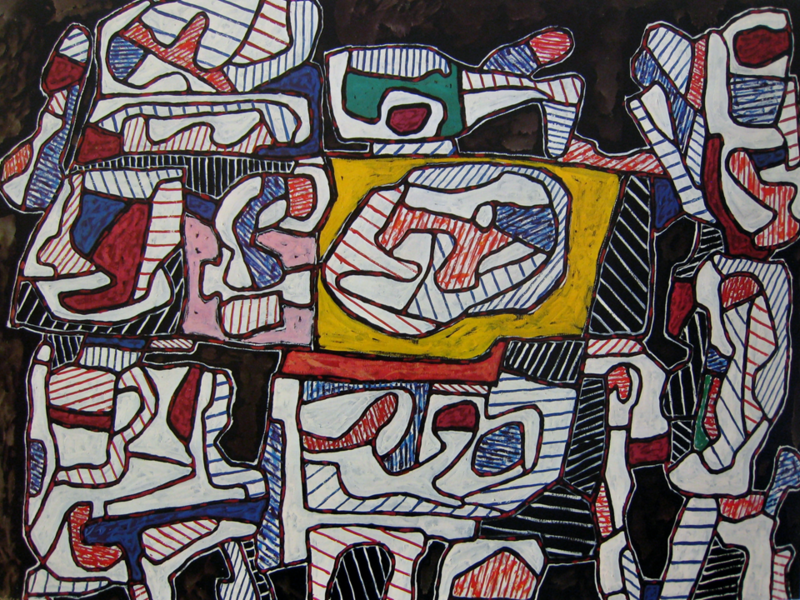 Geometric shapes and a lack of detail are often features of abstract art. A style that uses shapes, designs, textures and colors to depict an object in a way that may not look real but that emphasizes moods or feelings. Abstract art often uses geometrical shapes and bold, bright colors. Fauvism: A movement led in 1905 by Matisse, Derain, Vlaminck and Roualt and called by the critics “Les Fauves” (The Wild Beasts) because of the use of distorted shapes and vivid, spontaneous colors. The Fauves experimented with using intense colors in unrealistic ways to express personal views and feelings. In 1906, Dufy, Braque and Metzinger joined them. The movement lasted only three years, but its influence has been international and of lasting significance. Cubism: A style of art developed primarily by Pablo Picasso. 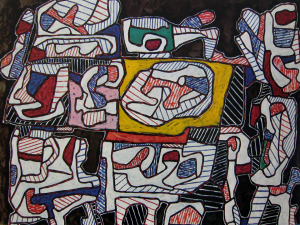 In this art style, the subject is viewed from all sides, then broken apart and reassembled in an abstract form to show all these parts at once, emphasizing geometric shapes. A new way of viewing the world in which natural forms are replaced by geometric ones. There were three phases to the movement. From 1906 to 1909 Braque, Cézanne and Picasso emphasized the structural character of objects. Dadaism: The style and techniques of a group of artists and writers, of the early 20th century, who exploited accidental and incongruous (inappropriate or lacking harmony of parts) effects in their work and who challenged established rules and standards of art and thought. An example of accidental effects might be a sculpture of just a pile of sand. An example of incongruous might be using an old beat up toilet seat as part of a Still Life arrangement. Pop Art: A style of art in which everyday, popular images (movie stars, political figures, commercial products) were used as subjects for the art. Common subject matter in Pop art included comic strips, product packages and advertising art. 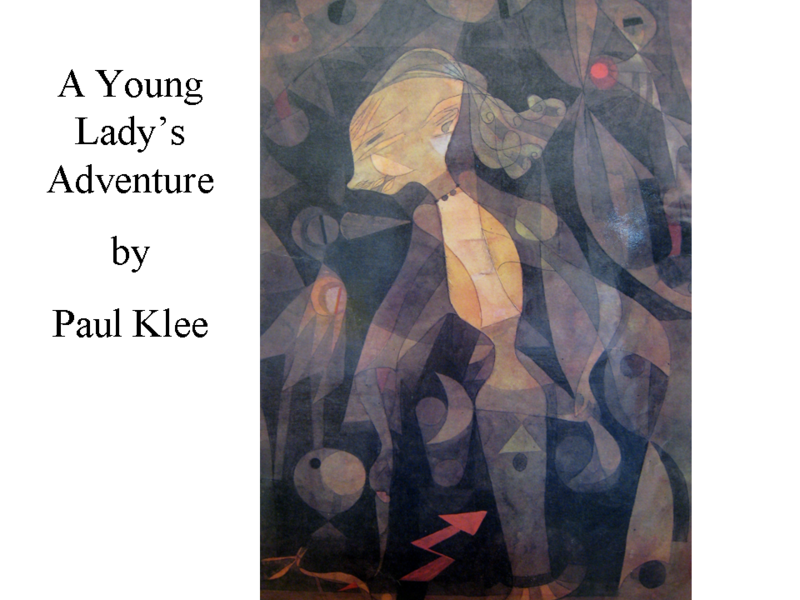 Paul Klee (pronounced “klay”) was born in Switzerland on Dec. 18, 1879. He grew up in a very musical family. Paul’s mother was a singer and his father was a music teacher. They taught Paul to play the violin when he was very young. Both music and art were so important to Paul that it took him a long time to decide whether he wanted to become an artist or a musician. Finally, Paul decided to study art in the city of Munich, Germany, which was an important art center at the beginning of the 20th century. Artists in Munich were trying exciting new things. Paul met some of these artists and became friends with them. Wassily Kandinsky, Franz Marc, and August Macke were painting in a new style that Paul had never seen before. He liked the bright colors and shapes these artists used and the simple, almost childlike way they painted people and objects. Paul realized that a painting did not have to look realistic, like a photograph, to be a good painting. Paul’s art is known as abstract art. The objects and figures in abstract art look different than the way they look in real life. Sometimes the objects in an abstract painting do not look like anything at all. Many of Paul Klee’s greatest paintings are just colors and shapes. Paul said he didn’t want to just paint a picture of what things looked like. He changed the natural look of things in his paintings for a reason. He said if that if people wanted to see natural and realistic things in paintings they should use a camera. Paul wanted to show more than what we can see. He wanted to show worlds that had never been seen before. He wanted to learn the innermost meaning of what he painted. Paul tried to show us our feelings, our experiences and our dreams and reach our hearts to show us, in his paintings, what we cannot see. Paul Klee’s studio was called “The Wizard’s Kitchen” by his painter friend. When he was working in his studio, a clutter of brushes, scrapers, paints, bottles, chalks, paper and easels surrounded Klee. From this chaotic assortment of materials sprang paintings, drawings, and sculpture that seem like visions created by a sorcerer—of a world somewhere between dreams and reality. The “Fairy Tales” of this painter are purposeful and controlled, although at first they seem more childish. Primitive art and the drawings of small children influenced Klee’s art. To Klee, art was a “language of signs”, of shapes that are images of ideas. Toward the end of his life, Paul immersed himself in the study of ideographs of all kinds—hieroglyphics, hex signs, and the mysterious markings found on prehistoric cave walls. These visual images were supposedly codes that contained messages. The background of this picture is filled with abstract images and shapes that represent a story of this young lady’s adventure. To Paul, each image had a meaning. Can you find the young lady’s curly hair? Her arms and feet? Can you see her shawl wrapped around her shoulders and arms? Can you find anything else that you recognize in this background? Red arrow, balloon in the left corner? Using tracing or velum paper, draw and cut out the shape of a young lady or a young man. Glue the transparent shape to the center of black paper after it has been colored and cut out. Now, make up an adventure story in your mind and create shapes to symbolize the events of your story. The symbols should be abstract enough to only have meaning to you, just the way Paul Klee did for his painting. Color your transparent shapes with colored pencil and glue to the background. It might be fun to stand and tell the class the story the picture represents. Create a list of objects and have kids randomly choose two from a bowl for creating an abstract picture. Your list should be long enough so that everyone could pick two different objects. Your list might include shoe, flashlight, toothbrush, pan, spoon, pliers, sock, chair, scissors, pencil, motorcycle, house, tree, flower, bird, donkey, screwdriver, monkey, glasses, watch, ring, bracelet, slingshot, fishing pole, file cabinet, desk, ironing board, tire, bicycle, hair dryer, grapes, bed, toaster, can opener, etc. To make the object abstract they need to exaggerate the object, rearrange its parts or completely redesign it. Marc Chagall used memories of his childhood and images from his dreams to come up with a beautiful, magical and mysterious kind of art. Marc Chagall was born Moishe Shagal, on July 7,1887, in the small village of Vitebsk, in Russia. Marc had seven sisters and one brother. His father was a fish seller and his mother owned a small grocery store. His Jewish parents were very poor. People who lived in Vitebsk were poor and had hard lives. In those days, Czars ruled Russia. The Czars persecuted Jews and forced them to live in restricted villages called shtetls. Still, many of Chagall’s happiest and most magical paintings are based on memories of his village, or shtetl. Marc never saw a painting or drawing until he was 13 years old. Art and artists weren’t part of most people’s lives in his small, poor village. In 1907, when he was 20, Marc went to St. Petersburg, the Capital City of Russia. There he studied the work of well-known Russian artists and began to paint his first mysterious artworks from his memory. Marc eventually went to Paris, the art capital of the world, to live and study even more about art. Marc kept his work original and unique because of his idea of using dreams and memories from his past. Marc went back home to Russia for a short visit, which turned into a longer seven year stay, because the government wouldn’t allow him to leave Russia after WWI began and then the Russian Revolution. While in Russia, Chagall made paintings for the new Russian government and organized many museums. He also painted a large mural for a Jewish theatre in Moscow. Let’s take a walk through a picture. Can you tell a story about this picture? Can you smell the hay in the wagon as you go by? What things do you see? The chickens? Have you ever been on a farm where there are chickens? Can you find the people? What are the people doing? Are these fairy-tale houses or real ones? Do you live in a house like these houses? Are all the roofs different from each other? Is one more special than the others? Does your walk through this picture follow a straight line? No, it curves and goes in and out between the buildings. What things might you see that are hidden from us now? Although there are things we can identify in this picture—buildings, townsfolk, animals, tools, wagon—they are still arranged in an abstract way. The view of the village in Chambon-sur-Lac has buildings twisted into strange angles. It is not a painting like a photographic or realistic view of a village. 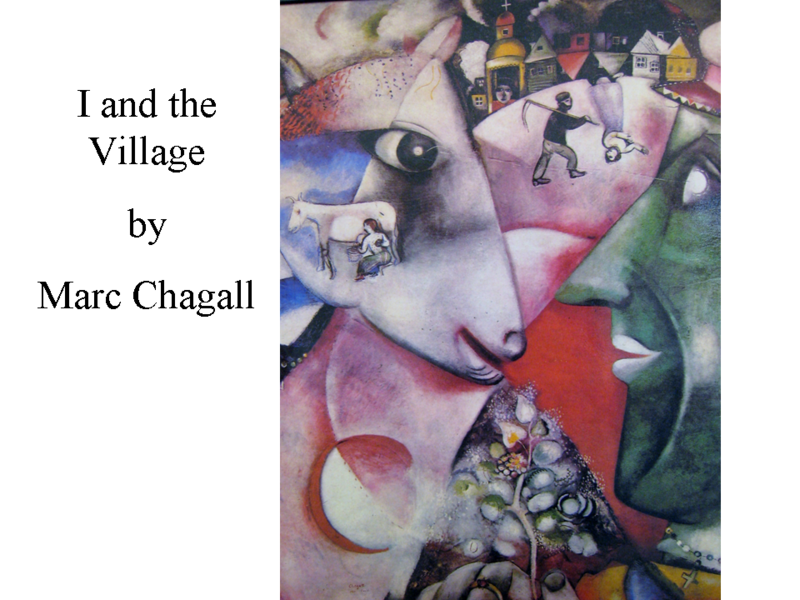 Chagall has chosen a section of the village and isolated it. Can you find the many different buildings Chagall has crowded into our view? Can you see how they are tilted in different directions, like they are about to fall over? Can you see how the building shapes don’t fit together in a realistic way? Do you notice how the angles of the buildings kind of move into each other and over each other? The buildings also block our view of anything else. The good thing about having to stay in Russia was that Marc Chagall fell in love and married Bella Rosenfeld. He was a devoted husband and showed his love for Bella in many paintings that included the two of them. In 1922, Chagall and Bella left Russia for good and took their daughter, Ida, with them to Berlin, Germany. They moved again, to Paris, in 1923. He and Bella lived in France until WWII began. Hitler, the German Dictator who was attacking European countries with his armies, hated Modern Art and Modern Artists. When his armies took over cities, Hitler would have the Modern Art paintings destroyed or taken out of the museums. The worst part was that Hitler hated anyone who was Jewish. Marc and Bella were both Jewish. In 1941, they left France and settled in the United States. Just before the war ended, Marc’s beloved Bella became ill and died, in 1944. 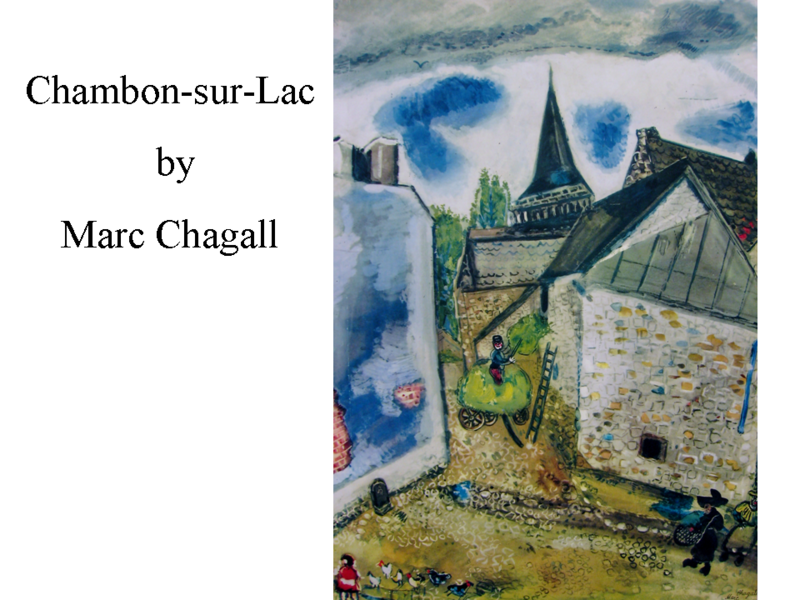 Chagall stayed in the United States until 1947, when he returned to Paris. He died there in 1985, at the age of 97. Marc often painted animals doing the kinds of things people do. Many of the Russian Folk stories and fairytales that Marc grew up hearing as a boy told about animals that were humanlike. He always loved animals and enjoyed talking to the goats, chickens and friendly cows around his village. 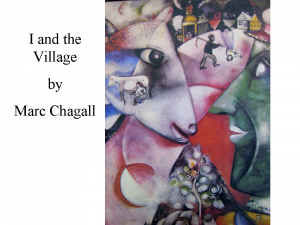 In I and the Village, Chagall has used ABSTRACT SHAPES, along with ORGANIC (or BIOMORPHIC) SHAPES of people and animals and REPRESENTATIONAL SHAPES of buildings. Can you find the two circles in the center of the picture? Can you find any triangle shapes? Can you see the close up picture of the man and the cow looking at each other and the far away pictures painted on top, in the background? Can you find the woman who is walking upside down? Can you find two buildings that are upside down? It is the arrangement, the way the artist has put these individual things, scenes and shapes together, that creates the abstract quality of these pictures. The laws of gravity do not apply to the people and objects of Marc Chagall’s paintings. This also helps create an abstract quality in his art. The man, whose face we see on the right side of I and the Village, is remembering his childhood in a small village. This picture represents memories of Marc Chagall’s life. Create a painting of your house and your neighborhood. Include your neighbors and the animals that live there. Create a picture of a place from one of your dreams. Include things in your picture that you might see in a dream, like upside down buildings, floating people, animals with human characteristics. Use a lot of bright color in your picture. Create a picture of animals doing human activities. How about a portrait of a cow family on a picnic or a mother chicken baking bread? Write a story to explain your picture. Does anyone have a guess what this picture may be? Do not tell the class the name of the painting until after they have a chance to guess a few times. Point out that the picture is ABSTRACT because it doesn’t look like anything real. What does music look like? Point out that we cannot SEE music, but only hear it. Music is not concrete. This abstract painting shows a MOOD or a feeling. What you see here is the way that the music Georgia was listening to made her feel as she painted. 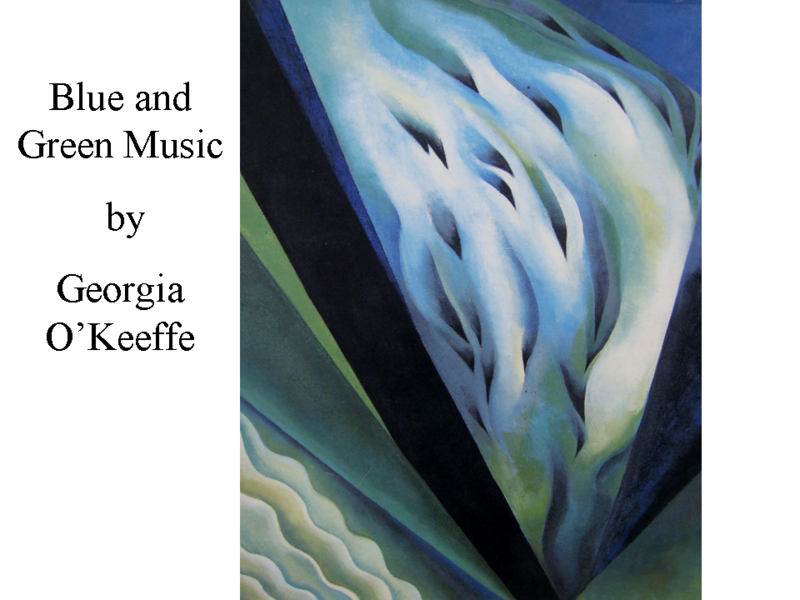 The music made Georgia picture blue and green in her mind, to paint on this canvas. What type of music do you think Georgia was listening to while she painted this picture? There are many LINES in this picture. Notice how some lines are very light and some are very dark. These are the lines that the sound of the music she was listening to inspired her to paint. Can you see any LINES that remind you of MOVEMENT? The wavy lines in the bottom left corner are like rippling waves. The curving lines and shapes in the center appear to be moving or blowing towards the left of the picture. Bring in a type of instrumental music—symphonic, piano, organ, brass, string, classical, marching, waltzing, swing, jazz, lullaby, etc. Before playing the music, have the class get their watercolors and painting supplies ready. Tell the class not to start painting until the music begins. Explain that when the music starts they need to listen to it closely. After they have listened for a few seconds or so, they need to choose colors that the music reminds them of. They ARE NOT supposed to paint a PICTURE with the paint! They should only paint lines—curved, wavy angled, crooked, rounded, squared, pointy, flat, skinny, wide, narrow at one end and fat at the other—any type of line that seems to match the music they hear. Explain that the painting MUST stop when the music ends so they WILL NOT have time to think about WHAT they are painting, only HOW. Make it clear that they are to listen to the music and let it inspire the way they paint. This is a painting with feelings, a MOOD. It should show the feelings that the music gave to them as they listened to it. Bring in FOUR DIFFERENT types of instrumental music—soft, loud, calming, exciting. Give everyone a large sheet of white construction paper. Have them fold it twice, to divide the paper into four equal squares. Instruct everyone to take out their crayons, markers or colored pencils. (Crayons and markers work best for this project.) Explain that you have brought four very different types of music with you. Each time you play one of the types of music, they will need to fill in one of the squares with the colors, lines and shapes that the music makes them think of or feel. Each type of music should remind them of different colors because the music sounds are each very different. Remind the class that they will only color LINES and SHAPES, NOT objects. The pictures are supposed to be very abstract and not resemble anything real. They should only be coloring the way the music makes them feel as they listen to it. Write the titles of each of the four works of art on the back of each picture. The titles should include the colors and the word MUSIC. Consider offering a small prize for the most original title. Charles Demuth was born in Lancaster, Pennsylvania, on November 8, 1883. As a boy he injured his leg and was left lame. Because he couldn’t be as active as he had once been, Charles began to draw and paint as a boy. When he grew up, he studied at the School of Industrial Art, in Philadelphia, and went on to study at the Pennsylvania Academy of Fine Arts, in 1905. In 1907, Demuth went to Paris to study painting. At that time, Fauve painting was very popular. In French, “Fauve” meant “wild beasts”. The Fauve artists loved to paint with wild colors and simple, less realistic shapes. Charles enjoyed the fun, bright way these artists painted and he created some watercolors following the Fauve style, while he was in Paris. Charles returned to America in 1908 and continued his studies at the Pennsylvania Academy until 1910. During this time, he became more interested in drawing people. His people began to look increasingly abstract. In other words, he stopped trying to make them look very realistic. In 1912, Demuth returned to Paris to attend more art classes. He became one of the few American artists of his day with firsthand understanding of the new European painting styles of Cubism and Dadaism. Charles studied both styles on this second trip to Paris, and focused on abstract ideas. He developed his own unique art style inspired by these two new European painting styles. 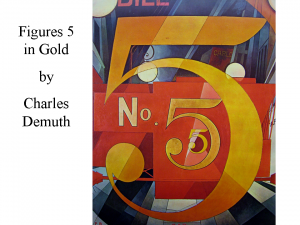 I Saw the Figure 5 in Gold is, according to the artist, a “Poster Portrait” of his poet friend, William Carlos Williams. Charles died in Lancaster, Pennsylvania in 1935. The title is taken from a poem by William Carlos Williams, whose name as “Bill”, “Carlos”, and “W.C.W.” also forms a part of the design. In the poem, the figure 5 appears on the side of a red fire truck, speeding past. In the painting, the figure 5 has become the dominant feature. The fire truck has been reduced to red shapes in the center that, unless the viewer knows the poem the artist based the painting on, are so abstract they would probably never be identified as a fire truck. The figure 5 is repeated three times to reinforce its persistence in our memory as the fire truck rushed on through the night. This painting is considered a direct ancestor of “Pop Art”, which Artist Andy Warhol and Roy Lichtenstein* made popular in the 1960’s and 1970’s. 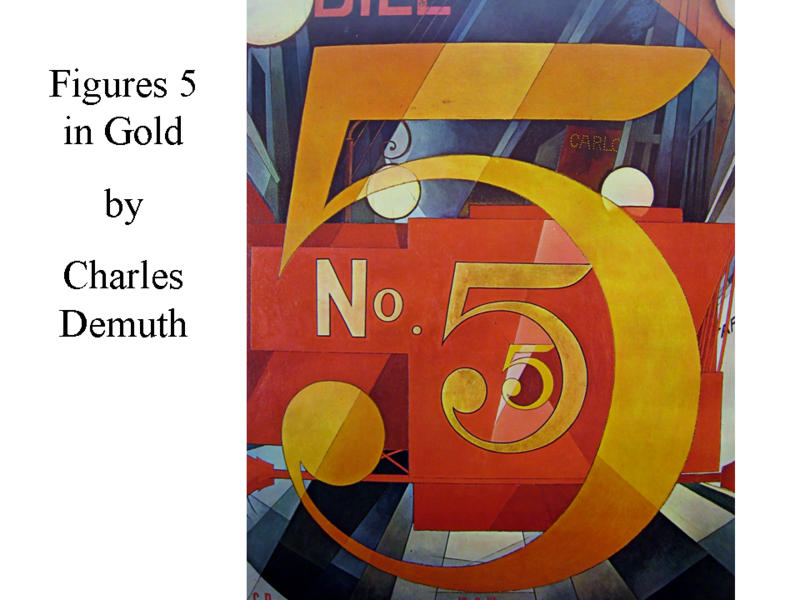 The artist uses the number 5 in a repeated, abstract arrangement. Discuss FAUVISM, CUBISM, DADA and POP ART. The artists who painted in these styles weren’t that interested in making what they painted realistic. They were more interested in creating a MOOD or in making people look, and then look again, when they saw their paintings. If your school has a die-cutter, give the kids a number representing their age (in a first grade class this would be 6 and 7), cut from tag board. Instruct kids to trace the number several times on colored paper. Cut out the numbers and glue to a large piece of background paper. Some numbers could even overlap. Decorate the page with abstract and geometric shapes, patterns and colors. Turn this project into a “Poster Portrait” by incorporating the kid’s own complete names, nicknames and initials into the artwork. Use cut paper for the shapes. Joan (wahn) Miro (Mee row) was born in Barcelona, Spain, on April 20, 1893 and enjoyed drawing when he was a boy. His father persuaded him to take business classes and at the age of 17, Miro graduated and began a job as a bookkeeper. This led to a minor nervous breakdown, followed by a bout with Typhoid fever, which finally convinced his father that he was not suited for business and office work. Miro’s father finally let him enroll in an art school but insisted that he learn something that he could support himself with. In his father’s eyes, that was NOT being an artist. Despite his father wanting him to have a more practical and stable job, Joan eventually became a very successful artist and made a very good living at it! He died on Christmas day, in 1983, and was buried in Barcelona, the same place he had been born. 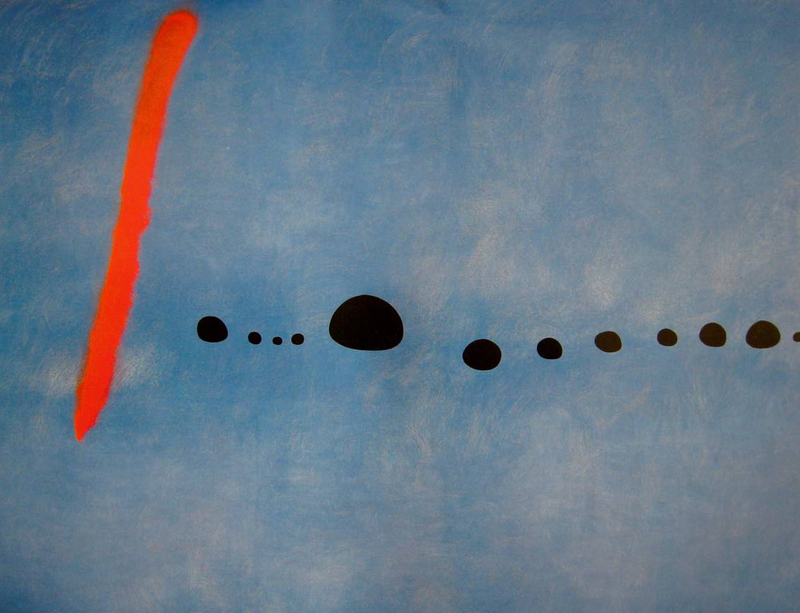 The artwork that Miro is most famous for is Abstract Expressionism and Surrealist (dream like) painting styles. His work is really in a category of its own. 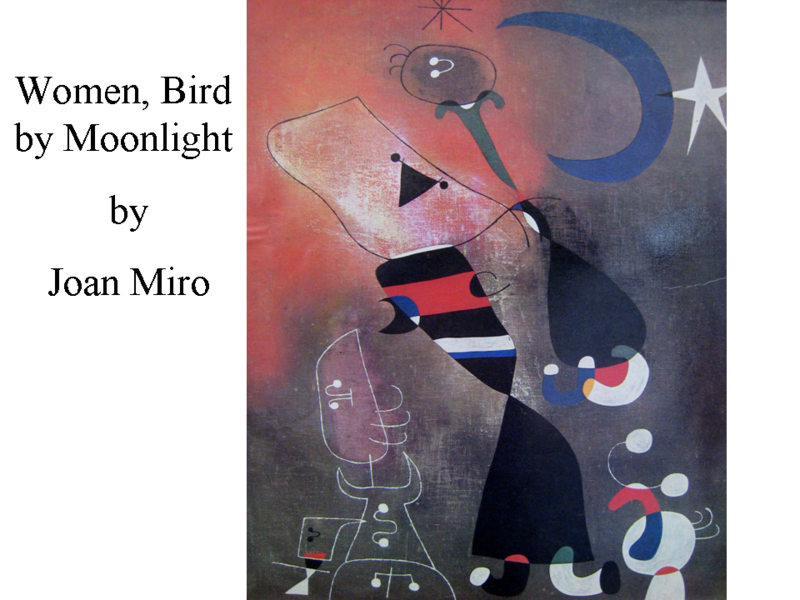 Miro always made a point to never explain his art. He only gave the viewer hints of what his pictures might represent; with the titles he gave his paintings. Miro wanted us to use our imaginations to see what was in his paintings. He painted people and animals in very strange ways. Sometimes the people resemble stick figures and at other times they just look like curvy, colorful blobs. How many women can you find in this picture? Opinions will vary; there is no wrong answer. Can you figure out where the bird is? What else can you recognize in the picture? Crescent moon and stars. The star on the right is easily recognizable but the other way Miro painted stars was like a large asterisk. Notice this second type of star at the top point of the crescent moon. What colors did Miro use in this painting? Name the colors. Blue, red, black, white, a small spot of yellow and two spots of green. See if the class can notice the small yellow and green spots. Create a person and a different animal “by moonlight”. Pattern your characters in the same unique and unusual style of Miro. Do the characters in Joan Miro’s painting resemble a realistic woman or bird? What types of shapes, patterns and colors do you see in his painting? Include as many details as you can that mimic Miro’s style. Use only three colors, along with black and white, to color your picture. Don’t forget to add the moon and a star or two. Born in Charlotte, North Carolina, in 1907, Charles Alston was a painter, sculptor, graphic artist, illustrator and educator. He studied at Columbia University and New York University and was also a teacher in Harlem. His work has been featured in many magazines and he had many exhibitions of his work in well known galleries. Alston was a well-known African American artist who became known in the 1930’s because of a government sponsored program with the Works Progress Administration. 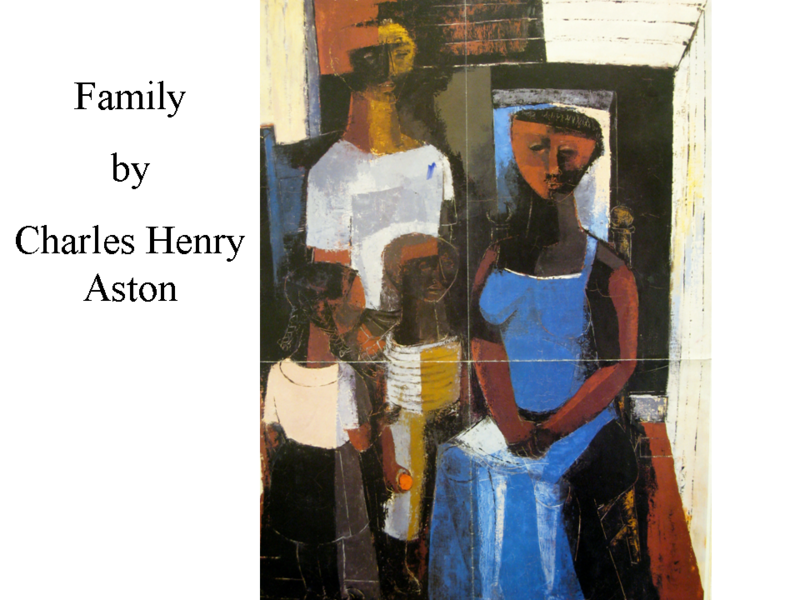 Alston painted in many different styles but chose abstract for Family. His artistic decision expresses the unity of the black family and offers an excellent example of how artists match the way they paint with the feeling or MOOD they want to express. Alston mainly painted images as seen from the Black experience. This is an Abstract group portrait of a family. It is abstract because the artist did not try to make the people look realistic, the way a photograph would. Alston designed this picture to show the viewer the unity of the black family in many ways. The color creates large, flat shapes. This is an idea borrowed from Cubism, which is a style of painting that fragments (or breaks up) shapes to show how they actually fill space [Cubism was pioneered by Pablo Picasso.] In Cubism, the shapes of things are more important than the details. The artist wants the viewer to see a close family group by the way he has presented them. They are arranged in a circle, the father standing behind the mother, who is seated, and two children, one boy and one girl, standing before them. Notice the gestures of the family members towards each other. The little girl is facing her brother. The father has his hand on his son’s shoulder. The children stand close beside the mother. If you look closely at the mother, you can see how the artist has drawn the outline of her strong, study legs underneath her blue dress. This might be the artist’s way of showing the viewer that the mother of this family is a strong woman. How do you feel about this family? Is there love in this family? Why do you think so? Can we tell anything about the way this family feels about each other from the way the figures in this family portrait are placed? They are placed close together, the little girl is facing her brother in a friendly way, and the father has his hand on his son’s shoulder in an affectionate gesture. They seem to be a close family. How would the painting be different if Alston had painted it in a realistic manner? Is it detailed or suggested? Actual or exaggerated? What colors do you see? Bright or dull? Strong or weak? What types of shapes do you see? Most of the shapes are geometric. There are mostly square shapes. The colors in the picture even create squares. What takes up the most space—the people or the background? The people fill most of the picture. Where is the Focal Point of the painting (center of interest)? What is the first thing that your eyes notice? The mother. The artist wants to point out that the mother is extremely important to this family. How does the painting make you feel? What type of MOOD did the artist create? A warm, friendly, happy mood, although the sparse background gives the idea that this is a poor family. Would you like to be a member of this family? Do they remind you of any people you know? Why do you think Alston didn’t paint faces on the figures? By leaving off the faces the people become universal. Could this be any family? Compare Alston’s family with other painted portraits of families. Ask the class how they are alike and how they are different. Find a realistic family portrait painting, one that looks like a photograph, for this comparison. Stress the abstract quality of Alston’s painting when comparing. You might discuss how families have changed and the ways that people today have created new family groups. Many kids today live with grandparents or only one parent, or uncles and aunts, half brothers or half sisters, step brothers or step sisters, cousins and sometimes close family friends make up part of an immediate family group. In 1955, when this picture was painted, most families had a mother and father at home, along with only the couple’s children. Make paper collages of families. There are many square and rectangle SHAPES in this picture. Cut some squares or rectangles from colored tissue paper, to glue in the background of a family portrait. After the shapes have been glued down, draw a portrait of you and your family on a separate piece of paper and cut this out. Be sure to draw the family large enough to fill up most of the background. Glue your family to the background. Cut clothing from the tissue and glue it down. A family could include your and your grandparents or you and another member of your family—one parent, one sibling (or all your siblings), an aunt, an uncle, one grandparent, etc. Create your paper collage family portrait in a way similar to Charles Alston—the people are mostly shapes and color, there is not much detail, and there are various squares and rectangles of color in the background as well as the people. Don’t forget to pose the people in your portrait in a way that creates a caring, loving and friendly MOOD, just like Alston did. Older kids might do a cubist family portrait, outlined with markers. A simple and very dramatic way of creating a cubist family portrait is to draw a simple line drawing (like a coloring book picture) of the family group on a rectangle of plain white paper. The people should be large enough to almost fill the paper. Try to leave very little empty space in the picture. When the drawing is finished, cut it into squares that are approximately the same size. Then, rearrange the squares of the picture to mix up the portrait and glue it on a colored background that is larger than the picture, to create a frame. When the glue is dry, color the shapes of the squares individually and don’t worry about matching the colors in the squares next to each other. Use black, white, brown and only two other colors. It isn’t necessary to color inside the lines of the drawing. Color squares or rectangles of color on top of the lines, instead of inside the lines. See what an interesting portrait you can create by rearranging the SPACE of your picture! Cut people and furnishings out of catalogs and magazines and experiment with arrangements for group portraits. Write a story about this family, where they live and what they do. Sketch one of the people from a different angle and paint with watercolor.